Brothers Ted and Greg Krasel created the Microscale line of decals covering subjects mainly for trains and aircraft. Around the mid 1990s the brothers had a disagreement regarding the business and the company was split into two lines. Greg kept the railroad line retaining the Microscale name, while brother Ted kept the military ones under a new name - Superscale. Greg Krasel passed away a few years later and the Microscale line was sold. Circa 1999, Superscale ceased production, but it seems that Ted Krasel tried to revive the company, though this appears to have been brief before Superscale died completely. Though Superscale now appears to be defunct there are a lot of the old sheets still around. 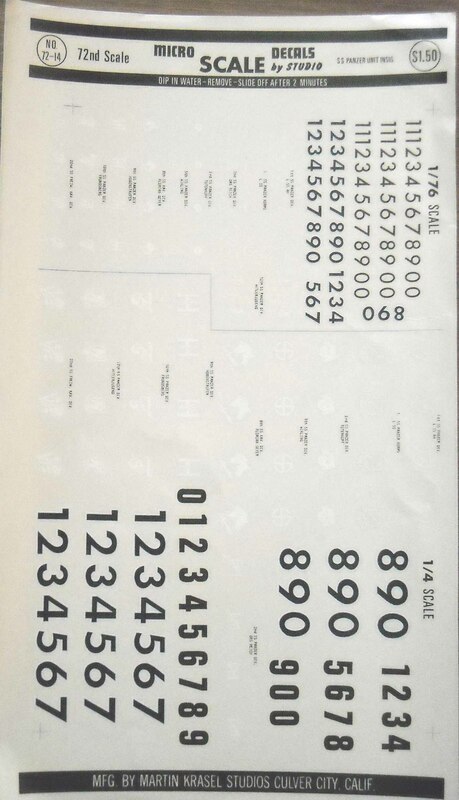 Microscale still exists today, primarily as a railroad and general purpose line of decals, but they do offer a limited line of 1/76 scale armour decals which appear to be the original sheets issued under the Superscale line. 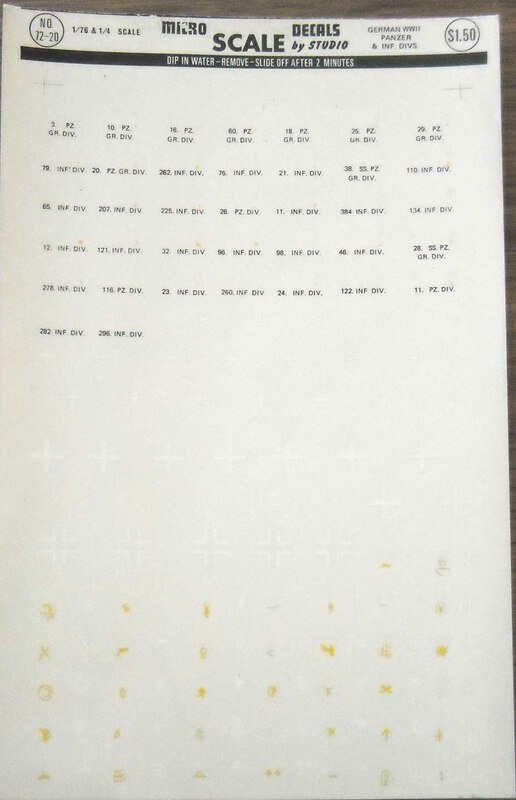 Some of the pictures found below are of the old sheets, printed on an off-white background, which makes them quite hard to see. Pictures of the re-releases on a darker background can be found on the Microscale website. 72-13 German Armor Unit 1/48th & 1/76th Scales. Ex 72-13 "German armor unit insignia WW2". - Steel helmet insignia for Grossdeutschland Div, in solid and outline form. 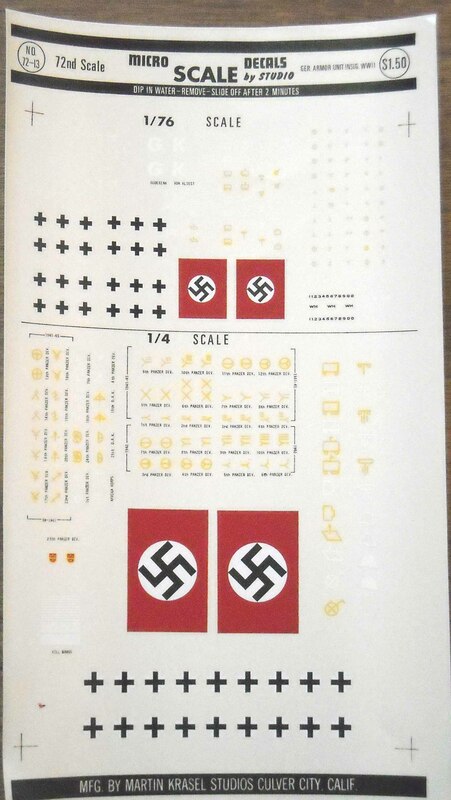 72-14 German SS Panzer Unit Insignia 1/48th & 1/76th Scales. Ex 72-14 "SS Panzer Unit Insignia"
72-17 British and Austrailain Armor Division Insignia 1/48th & 1/76th Scales. 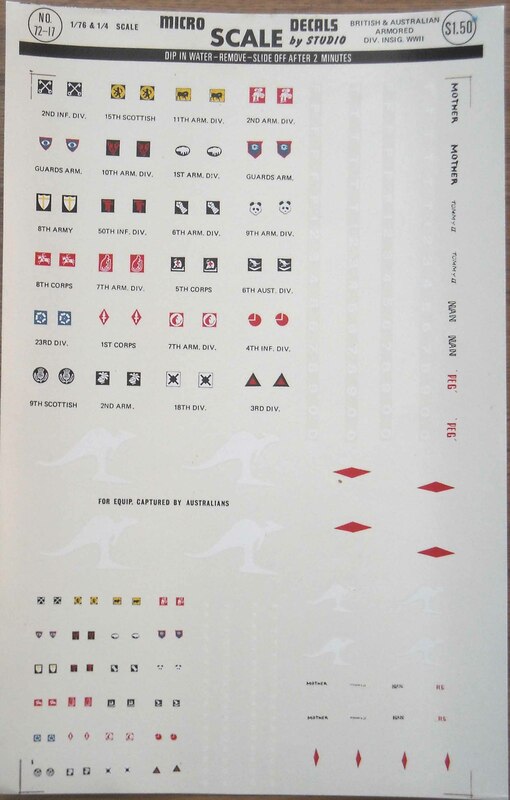 Ex 72-17 "British & Australian Armored Division Insignia WW2"
-- 1, 2 (2 variations), 6, 7 (2 variations), 9, 10, 11, Guards (2 variations) Arm. Div. U.S. Armor Codes & Insignia 1/48th & 1/76th Scales. 72-20 German WWII Panzer & Infantry Divisions 1/48th & 1/76th . Ex 72-20 "German WWII Panzer & Infantry Divisions"
- 3, 10, 16, 18, 20, 25, 29, 60 Pz.Gren. Div. - 11, 26, 116 Pz. Div. - 28, 38 SS Pz.Gren.Div. - 11, 13, 21, 23, 24, 32, 46, 65, 76, 79, 96, 98, 110, 121, 122, 134, 207, 225, 260, 262, 278, 282, 296, 384 Inf. Div. 72-19 Sturm. Luftfeld Panzer Grenadiers SS & Dak Divisions . Decals in 1/72 and 1/48. Ex 72-19 "Sturmgeschütz, Panzergrenadier, Luftwaffenfeld, SS & DAK Divisions"
-- 164, 334 Inf. Div. -- 1 SS. Pz. Div. -- 16, 17 18, SS Pz. Gren. Div. -- 7 SS Freiw. Gren. Div. -- 13, 21 Luftw. Feld. Div. -- 189, 190, 197, 237, 259, 666 "Sturm. Div." [sic]. I should check in detail, but as far as I am aware, there were no Sturmgeschütz Divisions, only Abteilungen, Batterien and Brigaden. 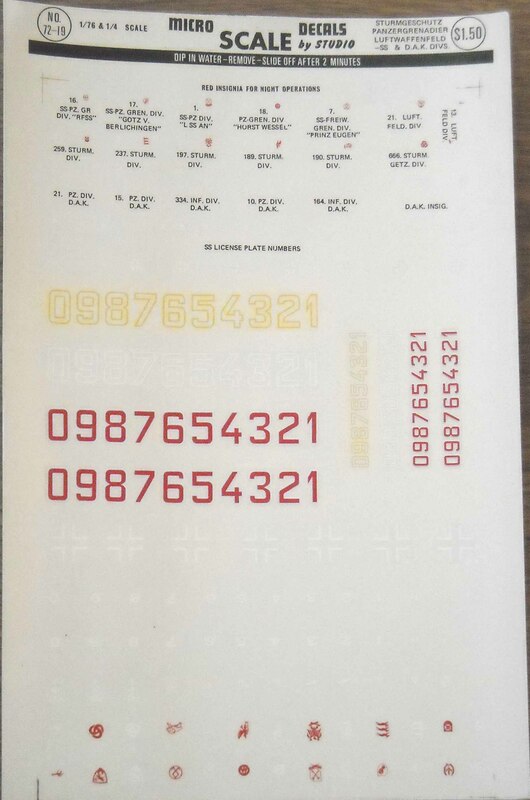 13-12 German Division Markings & Numbers 1/76th & 1/72nd Scale. 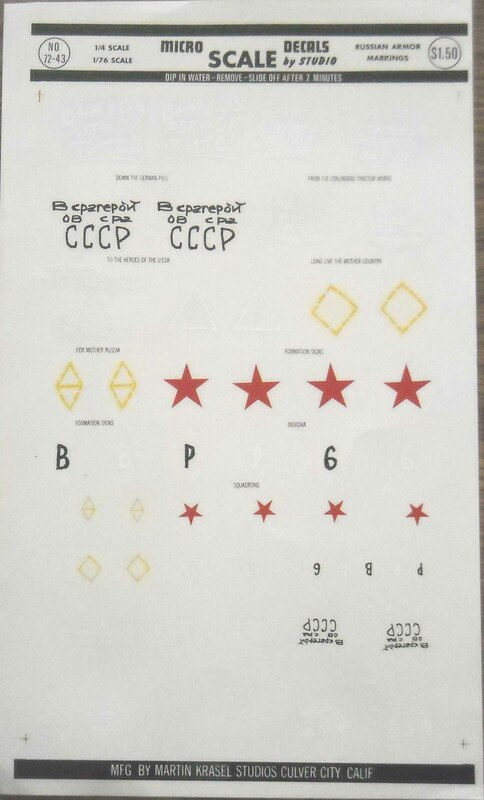 13-13 Russian & Polish Markings & Insignias 1/76th & 1/72nd Scale. - Patriotic slogans: 'Down the German pigs', 'From the Stalingrad tractor works', 'Long live the mother country', 'To the heroes of the USSR', 'For Mother Russia'.